When creating a presentation, sometimes you need input or information from coworkers or friends, and you have to edit the presentation together. In traditional office productivity applications, you have to save your presentation, and then send it to coworkers by email or exchange a USB flash drive. 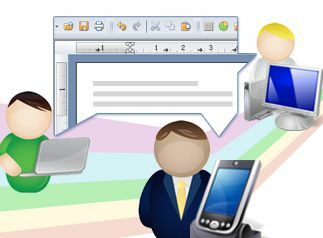 Moreover, they must install desktop clients, such as OpenOffice or Microsoft Office on their computers. While they edit the presentation, you cannot see their changes until they send the presentation back to you. Much time is wasted in emailing attachments back and forth. Now co-editing can help you solve this issue. If there is Internet access, every one can edit the presentation at the same time and you can see their changes immediately. The only requirement is that you have shared the file with them and set their access to the file as editors. In co-editing, you can edit different slides or the same slide. But only one editor can edit text in the same text box at a time. Other co-editors are blocked from editing the text within that text box when the first editor is updating the text. You can easily tell who is in the co-editing mode by checking the editors' photos in the sidebar. Changes from different editors are highlighted in different colors, and Connections Docs saves the changes instantly and automatically. When you finish your co-editing work, a default auto-publishing makes updates available to readers as soon as the last editor closes the file. All editors can also publish manually at any time. Linda is an assistant in the IT department, and she is required to give an annual presentation on computer status to her team. Linda creates a presentation and needs data from IT representatives of the five teams. Before, Linda had to send email attaching the presentation to each representative, and then merge the versions together that were sent back by each person. Now Connections Docs can help Linda to finish the presentation efficiently. Linda creates a presentation with tables, shares it with the five representatives and sets their access roles as editors, and then asks them to complete the required information. Linda can view the report by the five representatives immediately. Then when the co-editing is finished, Linda can share the presentation with her manager and ask for review and comments.